New data revealed Wednesday by ChangeWave Research shows that Android has gone from just a 3 percent availability in the corporate market in November 2009 to 16 percent in August 2010. 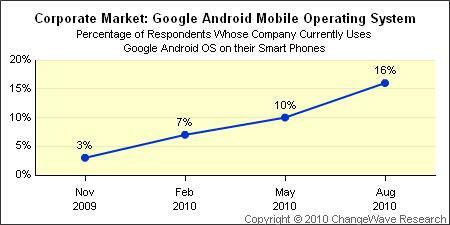 From May 2010 to August 2010 alone, the presence of Google's operating system grew from 10 percent to 16 percent. But during the same period from May to August, Apple's iOS —which powers the iPhone, iPad and iPod touch —managed to grow in the enterprise market as well, from 30 percent in the spring to 31 percent in the summer. Most of the growth of Android and iOS has come at the expense of the corporate leader, Research in Motion's BlackBerry OS. Though it still carries more than double the corporate market presence of Apple's iOS, BlackBerry fell 3 percent —from 69 percent to 66 percent —between May 2010 and August 2010. Other, smaller competitors also lost availability, with Microsoft's Windows mobile dipping from 10 percent to 9 percent in the three-month span, and devices from Palm shrinking from 7 percent to 6 percent. 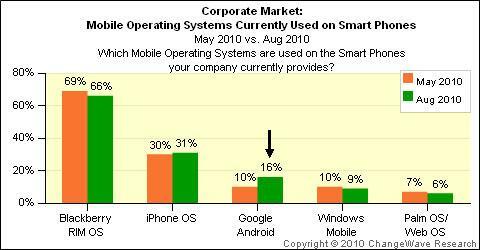 The survey of 1,602 corporate IT buyers asked the question: "Which mobile operating systems are used on the smartphones your company currently provides?" The survey also found evidence that even more change could be coming to the corporate smartphone market in the near future, as 35 percent of respondents said they plan to buy new smartphones next quarter. In July, another survey from ChangeWave fund that in the general market, Apple's iPhone was killing interest in RIM's BlackBerry. It also found that consumers are more satisfied with the iPhone than with Android handsets.